This wave study was painted yesterday immediately following Wave Study #43. The tide was rapidly going out by this time. The sun had mostly disappeared and the angle of the sun had changed. No luminous light shining behind the waves or on the waves for that matter. There was enough blue in the sky to change the colors of the sea a bit. I never get tired of watching the ocean. Ever changing it is. 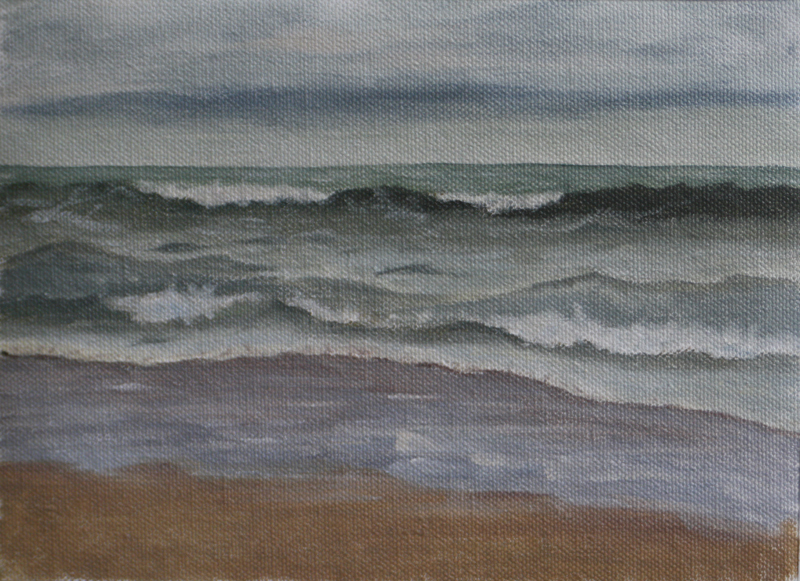 I went out with the ambition to paint three wave studies today. The sun was even brighter. Alas, I got the the beach and set up and a stiff wind suddenly sprang up. I couldn't hold on to umbrella and my easel at the same time. I have some new equipment in mind but will have to sell a few paintings first to buy it. The equipment I have at the moment is a Best Brella plein air easel umbrella and a Guerilla Painter thumbox mounted on a heavy duty tripod. The umbrella got very good ratings and came with a nice clamping system but, it was not designed to withstand conditions on the coast, hence my Tinker Toy fix and other issues. I may have to come up with a solution unique to the area. I sure would have loved to stay out painting today but the sun was too bright on my easel set up to not paint with the umbrella. The thumbox screws to the camera mount on the tripod and unfortunately is just too lightweight to hold still when I paint. I usually have to hold one side of it while painting. I got a sky in before the wind hit and I am sure I looked pretty comical with my body bent at an odd angle, one arm looped around the umbrella with the same hand holding onto the easel while trying to get some additional color notes down. I quickly packed up and then sat in the sunshine and sketched and observed for a while. I will be taking my weekend tomorrow and Saturday. I still have some organizing to do to paint full out without distractions. Sunday there will be a minus tide at a decent hour in the morning so I will be heading to Hug Point to try to get in the less accessible areas. The weather forecast looks good too. Keeping my fingers crossed on that! In the other areas of my life, my dressform arrived yesterday and I got it adjusted with the proper measurements. I will be posting about that on my clothing blog, The Artful Stitch, and starting to sew this weekend!